Please use the form below to pay your invoice online. You will receive a confirmation email of your payment once it has been processed. Payment will be processed within 24-48 hours of payment. 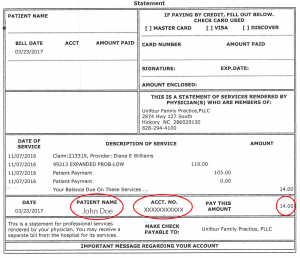 Please note the sample statement below to locate the Account #, Patient Name, and Statement Balance when making your payment. The account number can be found on your invoice by referring to the image above. This must be accurate in order to credit your account properly.